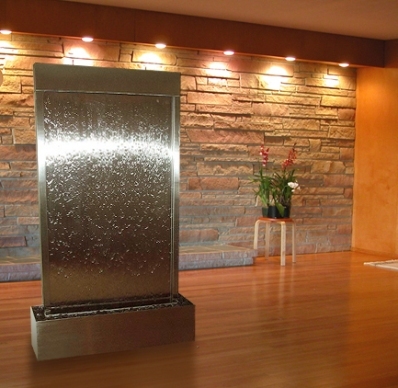 Custom stainless mirror water wall, offering a truly unique eye-catching water feature. The sound equals that of a mountain brook mesmerizing the viewer with calming tranquillity. A custom logo on these fountains makes a memorable statement in any lobby or entryway. Inc rock tray and pebbles. Call for details. Image do not correspond to mesurements.